save the date! July 20, 2019 is the 20th annual fair!! Since 1999, the South Perry District has celebrated each summer with a street fair. Over the years, the street fair has been held in many different capacities. 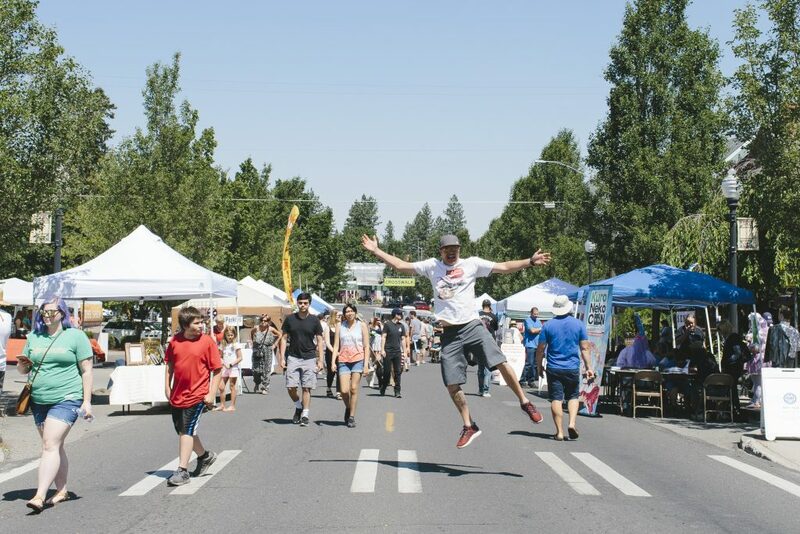 Currently, the fair covers four blocks of Perry Street with arts and crafts, activities, local businesses, and food vendors. There are two stages, a kid’s fair, and about 4,000-7,000 attendees each year. Be a Vendor: The South Perry Street Fair is committed to bringing in diverse, high quality vendors and having unique performances by local artists. The South Perry Street Fair would love to have you as a vendor! Additionally, we are open to ideas, and love collaborating on special programs and personalized events. Our goal is to raise money from our street fair to maintain and improve our streetscape and hopefully provide needed donated funds for nonprofits in the South Perry neighborhood. Apply Now! Sponsor the Fair: We could not continue to put on this magnificent event without the help of our community sponsors. Every donation has an impact, and we are so thankful to all of our sponsors. Sponsorship slots are currently available. Click here to see our sponsorship levels. For more information, please reach out to president@southperry.org for a donation packet. SPBNA is a 501(c)(3) non-profit organization and all donations may be tax deductible. Perform at the Fair: We have both a main stage and a side stage at the fair, and there is space for all types of performers. Want to be seen by hundreds or thousands of people at one of the largest street fairs of the summer? Send a link to your work, your rates, and your bio to: streetfair@southperry.org. Please allow 2-3 weeks to hear back. Have Questions about the South Perry Street Fair? Reach out to us below and one of our team will get back to you shortly. Please keep in mind that we are an all-volunteer organization, and as such, it can take 5-7 days for a response. Please provide as much detail as possible, so that your email can be directed to the appropriate person. Please allow 5-7 days for a reply, as we are an all-volunteer organization. Thank you! Happy Friday, friends!! Our vendor team will be reviewing Early Bird applications soon, so if you haven't sent in your application yet, apply now! We are so happy that ya'll are so excited about the South Perry Street Fair! We're pretty excited too!! We are an all volunteer team, and the time we spend responding to all your emails and messages is keeping us from getting those vendor applications you want out ASAP. So please try and contain that excitement for a few more days - applications will be out by April 15th. South Perry Street Fair shared a post. We've gotten a few questions about applications. We had some issues last year with them and so we are working extra hard to get them all in order for this year! We are hoping to have them out by the first week of April!Ready for an update? We've got lots to tell you! -- Vendor applications will be out in the next couple weeks, so check back for updates around March 15th. -- We will start booking bands in late March and early April, so if you've got a band you'd love to hear, tag them and have them reach out to us! -- Our new, just for events email address is: streetfair@southperry.org. Please use this to contact us instead of the old @gmail.com email. Thank you!! -- Our website is about to undergo an overhaul, and may be down for a few days to get ready. Reach out to us here or by email. -- Do you have photos from past street fairs or sweet South Perry photos? We would love to use them for our website and social media, with credit to you of course! Please reach out here or to Emily at president@southperry.org to chat. And don't forget to save the date!! July 20, 2019.